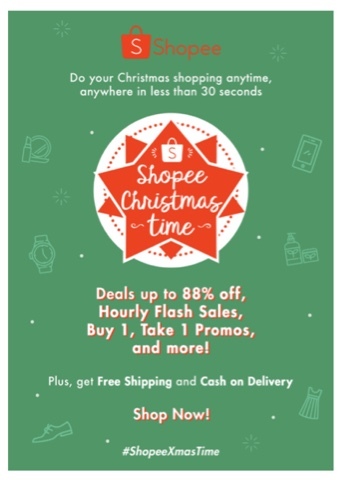 PRESS RELEASE: Score holiday deals with Shopee! Manila, PH - As vehicles begin to fill the roads this holiday season, preparing for all the Christmas gatherings is slowly turning out to be a chore among Filipinos. From having to attend to numerous parties with loved ones to accomplishing all work before the holiday break, among others, people are challenged to finish all their holiday shopping before traffic and lines in shops get worse. While proper scheduling for the different activities lined up for the upcoming holiday could solve one’s traffic woes, Shopee, one of the largest and fastest-growing mobile marketplace apps in the Southeast Asian region, stands as one of the best solutions to help Filipinos with their holiday shopping dilemma. “Shopee launched its holiday promos with the 11.11 sale, and now we’re happy to announce that we’re continuing with more Christmas deals that will offer Filipinos great discounts beginning December 1,” says Macy Castillo, Head of Commercial Business at Shopee Philippines. The holiday deals of Shopee continues with the 1200 Items at PhP 120 & below on December 1 until December 4, where over a thousand select items coming from all categories of Shopee will be priced at P120 and below. Another exciting sale to watch out for beginning December 1 until December 12 is the Fa-la-la-Flash Sale where consumers will be able to enjoy discounts starting at 50% for 12 select items from different categories such as Health & Beauty, Fashion, Consumer Electronics, among others. Late shoppers will enjoy the Beat The Sunrise Sale as it takes place in the early mornings of December 16 to December 25, offering consumers discounts beginning 50% across all product categories. All month round, Filipinos will be able to enjoy sales from different branded items which couldn’t be find in malls with Better than the Mall. Participating brands include CLN, Unisilver Time, Big & Small Co., Messy Bessy, Essliv PH, Ciracle, Makeup Revolution, Organic Surge, I Heart Makeup, and Maxell. Parents, aunts and uncles looking for the perfect gifts for their children, nephews and nieces will be able to seize the discounts by Richprime brands such as Disney, Chicco, winx, and more. Shopee will be offering free shipping nationwide along with its holiday deals, with Cash-On-Delivery as a payment option as well. Filipinos may download Shopee on the App Store and Google Play for free. Shopee is the number one mobile marketplace in Southeast Asia and Taiwan, where everyone can browse, shop and sell. It is a platform tailored for Southeast Asia, making online shopping easy, secure, and fuss-free through its strong payment and logistical support. The Shopee team believes in the transformative power of technology. As shopping on mobile devices becomes the ‘new norm’, Shopee aims to continually enhance its platform and become the region’s mobile commerce destination of choice. Shopee is supported by Garena, Southeast Asia’s largest internet platform provider. Shopee is available for download for free on the App Store and Google Play across the Philippines, Singapore, Malaysia, Indonesia, Thailand, Vietnam, and Taiwan. Christmas season start's when roads will filled with vehicle.